The commerce department is exploring export of non-Basmati rice to the Philippines and Indonesia, and sugar to Egypt under this mechanism to boost exports that have been hit by rising protectionism globally and slowdown in trade. The department sent a proposal to Egypt last week to participate in its sugar tender. The foreign trade policy for 2015-20 has set a target of $900 billion for merchandise and services exports by 2020, which is seemingly unachievable due to muted growth of traditional exports such as gems and jewellery, farm and engineering, liquidity crunch stemming from the Goods and Services Tax, and global factors. India’s exports rose 2.44% on year in February to $26.7 billion and the total exports for the entire 2018-19 are expected to be around $330 billion. Agriculture is one of the nine sectors that that the department has identified to take overall exports to $400 billion in the next five years.“The talks are at a preliminary stage. We are exploring if Indian non-Basmati rice can be exported to Southeast Asian countries through our state-run trading firms,” said another official . 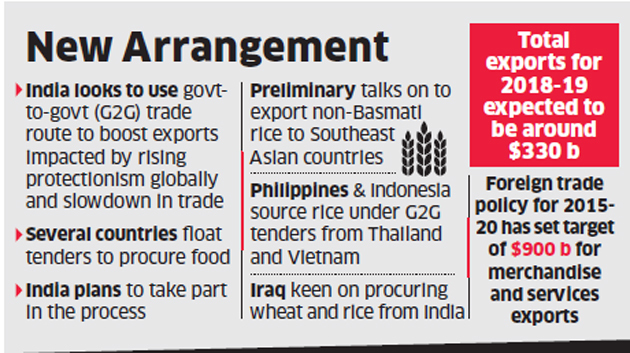 At present, the Philippines and Indonesia source rice under G2G tenders from Thailand and Vietnam. “Though a large part of their rice imports are done through private tenders, a small proportion of government tenders are floated and we are keen to participate in those,” the second official added. Iraq has expressed interest in procuring wheat and rice from India. Iraq, under its government food stuff procurement scheme, primarily procures wheat flour, rice, sugar, milk powder and edible oil. Iraq’s annual requirement of wheat is 4 million tonnes, of which 1 million tonne is imported. Of its 1 million tonne of rice requirement, one fourth was imported from Vietnam last year.